The Upanishads – what (or who!) are they?”This would be the response of many Hindus of today if asked about the Upanishads!The Upanishads are in fact Hindu scriptures. They can be thought of as portions of the Vedas, but are also separate texts in their own right. They form the basis of what is known as ‘Vedanta’, meaning ‘the end of the Vedas’, implying that the Upanishads can be thought of as the essence of the Vedas. They have a very important place in Hinduism, forming the basis of mainstream Hindu philosophy, and being accorded an authoritative status by most almost every sect. Such views are not rare. Many individuals from the scientific community who have undertaken a serious study of these texts have expressed similar sentiments. This is because the Upanishads teach many scientific ideas, such as evolution and the idea of the universe as a constantly expanding entity. The most important teaching from the Upanishads, which may have very important implications for future of science, is the idea that the primary substance or building block of the universe is consciousness (chit), rather than matter or energy. The Upanishads contain the essence of Hindu philosophy. The extensive range of topics covered by the Upanishads includes the origin of the universe, the essential nature of the Divine Principle, the nature of the individual soul (Atman) and the essential nature of reality as Brahman (the absolute). They contain the unique teaching that the underlying reality to everything we see (or think we see) is essentially One spiritual essence. God, Man and the Universe are seen as part and parcel of the same ultimate reality, Brahman. When this knowledge is achieved, an individual is enlightened and sees the world as it truly is, instead of living in duality and delusion. The Bhagavad Gita, the most popular text of modern Hinduism, is in fact a synthesis of Upanishadic teachings. The Gita is described thus: the Upanishads are the cow; Arjuna is the calf, Krishna is the milkman and the Gita is the milk drawn by Krishna from the cow, and wise men drink that milk. It means that the Gita is a guide on bringing the Upanishad’s teachings into the realm of human life and struggle. There are numerous Upanishads, of which 12 are considered authoritative. These are the Aitareya, Brhadaranyaka, Chandogya, Isha, Katha, Kauhsitaki, Kena, Mandukya, Mundaka, Prashna, Shvetashvatara and Taittiriya Upanishads. 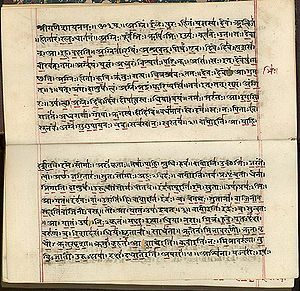 The Upanishads have their own unique style of writing ranging from simple dialogue with question and answers, narration and episodes to powerful similes, metaphors and symbolism to portray abstract concepts thus providing both spiritual vision and philosophical argument. They contain many short but powerful aphorisms such as ‘Aham Brahmasmi’ (Brhadaranyaka Upanishad) – I am Brahman and ‘Tat tvam asi’ (Chandogya Upanishad) meaning ‘Thou art that’, you are Brahman. In no other texts will you find such wonderful praises expressing the essential divinity of man. This age old unique teaching of the inner divinity of man is today becoming one of the most popular and practical ways of thinking about God, particularly in the West through the New Age movement. But whilst the teaching spreads we must not forget to acknowledge its source – Hinduism. The following is the Isha Upanishad – one of the shortest but most beautiful Upanishads – in its entirety. It consists of just 18 verses, after reading which you can claim to have read an enture Hindu sacred text. Even though it is very short, the Isha Upanishad has tremendous depth. Commentaries that have been written on it are frequently hundreds of pages long! 1. All the universe exists as an expansion for the Spirit, whatsoever changing thing there is in this changing world. Experiencing life through that renunciation do not desire what any man has. 2. Doing only sacrificial action here one may wish to live a hundred years. Only thus it is and not otherwise that karma does not cling to a man. 3. Sunless are those worlds, enveloped in blinding darkness, where they go upon departing who are slayers of their own Self. 4. One only, unmoving, swifter than the mind, the senses cannot reach him who moves front. Standing still he speeds beyond all things that run. In him the Lord of life sustains the waters of creation. 5. That moves; that moves not. That is far; that is near. That is within all beings and That is outside all beings. 6. He who sees all beings in the Self and the Self in all beings, henceforth has no more distress. 7. In whom the Self has become all beings, where can there be any delusion, any sorrow, for that man of discernment who sees only the Oneness? 8. He is all-encompassing, luminous, bodiless, without organs, beyond disease, pure and untouched by evil. The Seer, the guide of the mind, all-pervading, self-existent, he ordained all objects according to their nature from eternal equanimity. 9. Into blinding darkness enter those who worship ignorance. Into even greater darkness, as it were, fall those who are attached to knowledge. 10. Ignorance is of one movement, they declare, and knowledge of the other. Thus have we heard from the wise who related the truth to us. 11. The knowledge and the ignorance, who knows them both together, crossing over death through the ignorance, attains immortality through the knowledge. 12. Into blinding darkness enter those who worship destruction. Into even greater darkness, as it were, fall those who are attached to creation. 13. Destruction is of one movement, they declare, and creation of the other. Thus have we heard from the wise who related the truth to us. 14. Creation and destruction, who knows them both together, crossing over death through destruction, attains immortality through creation. 15. The face of truth is covered by a golden vessel. Remove that, oh Sun who nourishes all, that we may perceive our real nature. 16. Sun, our Father, solitary seer, death, who control the power of creation, disperse your rays and gather up your heat that I may see your most beneficent form. The Being in the Sun, He am I! 17. Let my life enter the immortal life and the body end in ashes. Om, Intelligence remember, remember your labour; Intelligence remember, remember your labour. 18. Fire, lead us by the perfect path to reality, God who knows all the ways of wisdom. Remove from us the wandering evil. The most full utterance of surrender may we offer unto you.